- Polarized lens help eliminate reflected and scattered glares. Care:Please use neutral detergent or soap water to clean, gently wipe dry with a clean soft cloth. - 90 days money back guarantee. - We provides LIFETIME AFTER SALE SERVICE for all WELUK products, in case any broken problem happens, pls feel free to contact our customer service. We will be happy to solve the problem until satisfaction. HD POLARIZED LENS - UV400 protection coating, absorbing 100% harmful UVA/UVB rays. 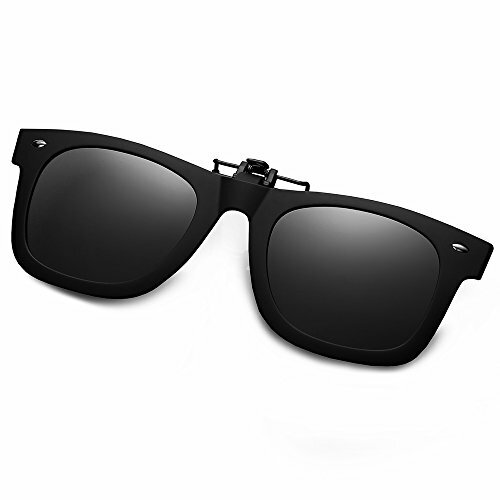 Clip-on polarized sunglasses are made of hd resin lens which can reduce glare and enhance contrast, improving visual clarity and reducing eye strain. RUBBER CLIPS - The clip-on piece is made of rubber and has rubber covers, preventing the scratches from your glasses. The rubber clips that hold onto your glasses well which provide you a durable, sturdy and protective product. FIT PERFECTLY - These flip ups are easy put on and easy take off, they are fit pretty snugged onto your glasses. Flip up sunglasses wayfarer featuring lightweight is designed for those wearing prescription glasses. It better than clip-on sunglasses, you can flip it up&down. LIGHT-WEIGHT DESIGN - Wayfarer style flip ups clip on sunglasses gives you a unique look. Lightweight designs are great suitable for Driving, Travelling, Cycling, Fishing, Climbing and Outdoor activities. 90 DAY MONEY BACK GUARANTEE - All WELUK customers enjoy 90 Days Money Back Guarantee. Customers can return and get refunded in case the purchasing is not satisfactory for any reason. You have no risk to try and we will provide you the best service. If you have any questions about this product by WELUK, contact us by completing and submitting the form below. If you are looking for a specif part number, please include it with your message.